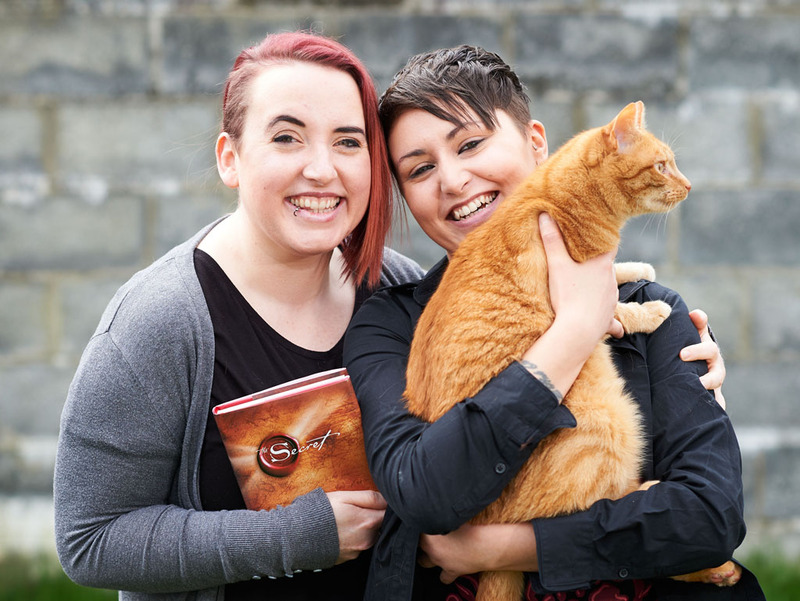 Faye Bradley and Marina Murphy who have won over 113 prizes in the past year to date, pictured with their cat Butch. Photograph by John Kelly. When they got in touch with The Clare Champion last Wednesday, Faye Bradley and Marina Murphy had won 110 prizes in different competitions over the past year. By the time they called into our office on Thursday afternoon, they were up to 112 and later that day, it rose to 113. The figure was up to 114 by Monday. The Ennis-based couple believe their phenomenal winning run is down to their use of the Law of Attraction, a philosophy that has gained prominence over the last 12 years, particularly due to the film The Secret and the book of the same name. One of the couple’s favourite prizes to date was a VIP experience to celebrate the 30th birthday of the National Lottery, won by Marina. Those who have read The Secret will be familiar with some of the main tenets of what the two women are talking about. It argues that people can attract what they want towards them in life, through visualisation, positive thinking, meditation and actively being grateful for everything that is positive around them. Even though Faye was only doing it to prove Marina wrong, she soon changed her mind. She accepts they do enter quite a lot of competitions but says the level of success is still remarkable. “A lot of people have asked us are you entering a lot of competitions. I suppose we are but we used to enter a lot of competitions before this and we never won them. She feels that while positive attitudes have brought them success in many competitions, negativity brings the opposite outcome to others. People who complain quite a lot are drawing yet more circumstances to themselves that are likely to give rise to complaint, Faye feels. A graphic designer, she feels her outlook has brought her a measure of success in her work too. The couple have a Facebook page called Our Attraction in Action, on which they put updates on their wins. Faye says they have had some good feedback. Being grateful for the positive things in life is an important part of their approach. They regularly write out long lists of things to be thankful for. Faye says she didn’t find it easy at the start but she believes it works for her. last Wednesday, Faye Bradley and Marina Murphy had won 110 prizes in different competitions over the past year. By the time they called into our office on Thursday afternoon, they were up to 112 prizes and later that day, it rose to 113.